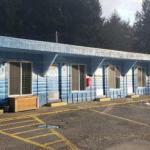 Just a 1-minute walk across the street from the Pacific Ocean Plainview Motel is located in Coos Bay Oregon. Crabbing and clamming gear are available for guests and guided clamming tours are provided by the staff of the motel. Each accommodation here provides guests with a kitchen or kitchenette a cable flat-screen and a seating area. Free WiFi access is available throughout the property. Shore Acres' Botanical Gardens is 12 minutesâ?? drive away and seals or sealion watching can be enjoyed at Simpson Reef just 15 minutesâ?? drive from the motel. Bandon Dunes Golf Resort is 33 km away.